Thanks for stopping by to check out Team Rack Em’ Up! We are a team of engineering students who have revolutionized the way gear is loaded onto your vehicle. The Rack em’ Up system is designed to make loading and unloading gear a breeze. When the gear is loaded and secured, the rack can be easily put back on the vehicle with the assistance of gas cylinder struts. When the gear is ready to be unloaded, a two step sliding-pivoting action will safely lower the rack back down with minimal effort. Rack Em’ Up is compatible with a variety of gear including: skis/snowboards, bikes, kayaks, camping gear, and more! discussion on how the rack should meet each individual function. Each concept was then discussed by the entire group, breaking them all down into their strengths and weaknesses, so that everyone had an understanding of how each concept could meet the functional requirements. Once everyone had an understanding of the concepts, the two main concepts of a spring loaded system and a gas cylinder system were unanimously agreed upon to be the frontrunners of the design concept. After the consensus process, it was agreed upon that the tilting method powered by a shifting center of gravity was to be investigated. The shifting center of gravity would be powered by a gas cylinder that will run parallel with the roof of the vehicle. After many iterations of designing, testing, and collaborating with potential customers, our final design has been decided. The images below show what the rack will look like when it’s in the retracted position (left) and the loading position (right). This design enables users to easily load and unload equipment. The main component of the rack are the gas struts. The gas struts enable the user to handle loads that they would otherwise be unable to handle without the Rack ‘Em Up system. 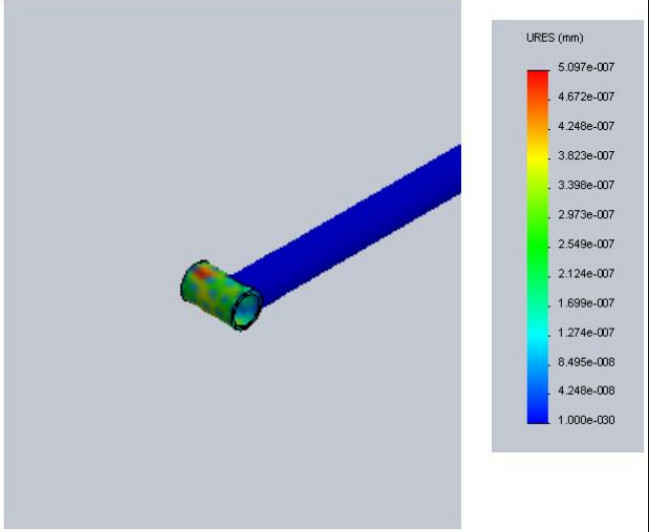 To ensure that the right material was selected for this design, a SolidWorks simulation was done. This simulation was done with 1020 DOM steel. The results show that this material is a perfect choice for the rack and its low cost will allow us to market our rack for a lower price than our competitors. Based on the success of the Proof of Concept, we have a full scale prototype that will show the full functionality of the rack. This prototype was built as carefully as possible and will be tested on multiple vehicles under different conditions to ensure it will meet all expectations. The fabrication process involved a lot of welding and cutting of the steel tubing. Welding the tubes together was done carefully to avoid warping of the steel. The most time consuming process of fabrication was honing and polishing the sliding tube. This interface needs to be as friction-less as possible so that sliding the rack out will be as easy as possible. Don is a Mechanical Engineering Senior interested in just about anything that has to do with engineering. He has a true passion for seeing engineering projects through from start to finish. He brings industry experience from the energy and aerospace sector. Dominic is a Mechanical Engineering senior interested in snowboarding and home brewing. He has experience in the design, manufacturing and maintenance of food processing equipment. Kyle is a 23 year old Mechanical engineering senior interested in hunting, hiking, working out and anything related to the outdoors. His experiences as a Supervisor at UPS for the past 6 years has brought time management and production based skills to the team in their quest to succeed with the design project tasked to them. Mike is a Mechanical Engineering senior, his passions include anything with a motor and the outdoors. He brings with him vast experience in manufacturing and problem solving. Josh is a Mechanical Engineering senior with a passion for action sports and the science behind it all. As an outdoor sports enthusiast and avid videographer, Josh is looking to use engineering to create anything from the next level unmanned aerial videography systems to the best set of golf clubs. With a background in gold mining process maintenance, he can offer a bigger picture perspective on projects.